Rates of medical student depression and suicide are higher than aged-matched peers. Although medical schools have implemented wellness interventions, no program has reported on interventions targeting social support. As one potential intervention, reflection groups for medical students led by psychiatry residents were designed and implemented. It was hypothesized that groups would encourage connectedness among peers, teach coping and emotional self-awareness skills, increase empathy, and decrease loneliness. Voluntary, biweekly support groups were implemented between 2017 and 2018 at Stanford University School of Medicine for first- and second-year medical students. Participants were surveyed at baseline and 6 months. Surveys included qualitative assessments of groups and validated surveys to assess empathy, wellness, and loneliness. Separate surveys assessed attrition. Analyses included statistical analyses (descriptive statistics) and thematic analysis. In both cohorts, a total number of 30 students participated in groups, and 18 completed post-surveys. Students reported groups improved well-being (55.6% strongly agreed, 27.8% agreed), enhanced self-awareness (44.4% strongly agreed, 38.9% agreed) and ability to empathize (50.0% strongly agreed, 27.8% agreed), and promoted connection (61.1% strongly agreed, 33.3% agreed). Initial attrition was high, with 84% of students not continuing due to feeling too overwhelmed by classes. Thematic analysis demonstrated groups may benefit students in improving impostor syndrome and connection with others (decreased loneliness), allowing exposure and tolerance to diverse perspectives, increasing insight into the importance of self-care and emotional self-awareness, allowing practice for collaborative skills, and increasing thoughtful approaches to patient care. 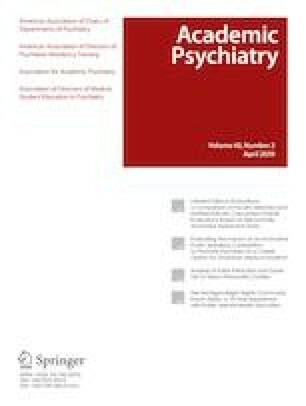 There is preliminary evidence reflection groups may be a feasible, effective intervention to improve loneliness and social belonging in medical school. The authors wish to thank the reflection group co-facilitators, the Office of Graduate Education, and Rebecca Smith-Coggins, MD, for their support of this program. Stanford University IRB granted exemption for this study, original approval 12/1/16 (continuation: 10/16/18), E-Protocol number: 39235, Assurance number: FWA00000935. Turner PL2016. Reports of the council on medical education: access to confidential health for medical students and physicians. American Medical Association. . https://www.ama-assn.org/sites/default/files/media-browser/i16-cme-reports.pdf. Accessed June 1, 2018. Salles A, Wright RC, Milam L, et al. Social belonging as a predictor of surgical resident wellbeing and attrition. J Surg Educ. 2018. https://doi.org/10.1016/j.jsurg.2018.08.022. Chokshi K, Vero E. ‘2018; April 8Reflection Rounds:’ fostering professional development and physical wellness through self-reflection. Abstract published at Hospital Medicine -11; Orlando, Fla. Abstract 52. https://www.shmabstracts.com/abstract/reflection-rounds-fostering-professional-development-and-physician-wellness-through-self-reflection/. Accessed February 26, 2019.